See the picture? 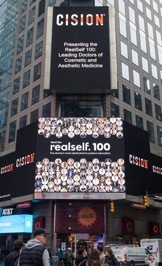 It’s an announcement in Times Square from RealSelf, the world’s most trusted online educational forum for aesthetic patients and their doctors. Every year, RealSelf honors their top 100 doctors in the nation with the RealSelf 100 Award—and our very own Dr. Oscar A. Aguirre is among them! The RealSelf 100 Award honors doctors for their outstanding dedication to patient education, service, and feedback. On RealSelf, doctors and patients exchange reliable information regarding all aspects of aesthetic treatments, from downtime and results to side effects and real patient reviews, to help aesthetic patients make educated treatment choices. Dr. Aguirre is committed to serving the RealSelf community because he’s passionate about empowering patients with reliable and trustworthy information. Whether it’s a question about the benefits of vaginal rejuvenation or the results of a labiaplasty, Dr. Aguirre takes the time to thoughtfully answer queries. He also posts before and after photos, an invaluable tool for showing the efficacy of a treatment or surgical procedure, as well as showcasing Dr. Aguirre’s skill as a preeminent pelvic surgeon. What’s more, Dr. Aguirre has more than 50 reviews from satisfied patients on RealSelf. See for yourself how Dr. Aguirre has positively impacted his patients’ lives! To learn more about treatments at Aguirre Specialty Care, call us today at 303.322.0500 or complete our online consultation request form.